Good news from the wild streets of Wilmington, Delaware: The Spinto Band, self-titled‘s favorite indie pop act, has finally finished their latest full-length and is close to sealing the deal with a new label. Not only that; they’ve also confirmed a month-long Thursday night residency at Brooklyn’s Union Hall. Three months of basement rehearsals went into the making of Moonwink, which was tracked in a month by Dave Trumfio at Kingsize Studios in Los Angeles. According to Eaton, the results were “much more exciting” and varied than the band’s last LP (Nice & Nicely Done, Bar None) because of this newfound focus. Not to mention the occasional brass outburst by Danny Levin, a sometime Rilo Kiley collaborator. “Moonwink is a lot more bizarre than Nice & Nicely Done,” explains Eaton. “The songs tend to go on interesting tangents rather than down a straight path. Indeed. For now, we’d like to offer the following exclusive download: “Summer Grof,” a breezy, spring-loaded burst of hand claps and head-circling hooks. 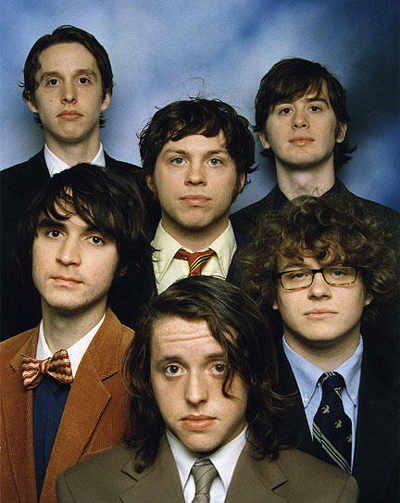 VIDEO FLASHBACK: The Spinto Band, "Oh Mandy"